You might say The Pomegranate is responsible for turning exotic Iranian dishes like fesenjaan and aloo gheysi into household names for Torontonians. 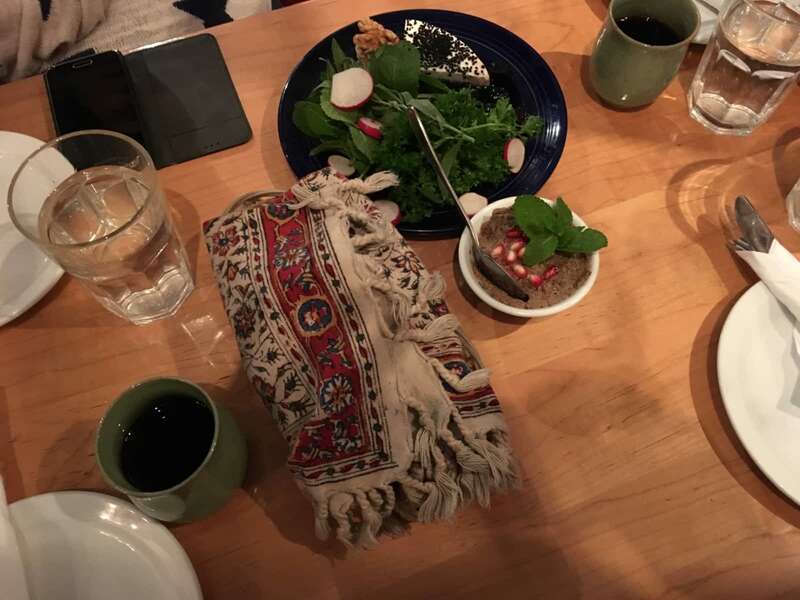 Danielle Schrage, co-owner and front of house manager, has collaborated with her husband Alireza Fakhrashrafi, co-owner and head chef, to reinvent the Iranian dining experience. Danielle met Alireza (who is originally from Tehran) while immersed in Iranian Studies. After collaborating together on an Iranian print magazine, the couple decided to explore the cultures’ tastes more literally. Both were from academic backgrounds with no formal training in the restaurant business. Alireza “just happened to be a really good, obsessive cook,” Danielle explains. She recalls that her friends were concerned about their decision to open a restaurant, but their skepticism was only fuel for the fire. “Nobody had confidence in us,” Danielle laughs. The couple approached the endeavor as researchers — observing the history, listening to peoples’ stories and experiences and recreating that for their community. With the knowledge, talent and passion, surely they had the right ingredients to make this work. The Pomegranate on College Street first opened in 2004 and is now one of three restaurants owned by the duo. Of the three, this is the place for authentic home-style slow cooking as enjoyed in Iran. a blend of English cucumber, walnuts, raisins and rose petals in a rich creamy herbed yogurt. delicious creamy yogurt sprinkled with shallots. dip of sautéed spinach, garlic and creamy yogurt. charred eggplant, persian whey, garlic and walnuts topped with crispy onion. charred eggplant in a mildly spicy garlic tomato sauce. creamy feta cheese, black kalamata olives, herbs and walnuts served with warm Barbary bread. the ultimate in stuffed vine leaves with a lemony blend of rice and herbs (4 pieces). vegetarian caviar – a tapenade of green olives marinated in a pomegranate walnut sauce with a generous amount of fresh garlic. pickled persian gherkins, aged garlic, shallots and a mixture of traditional vegetable torshi. a tomato-based tangy stew of yellow split peas, lamb chunks and dried lime topped with cinnamon. charred egglplant purée in a mildly spicy garlic tomato sauce served with saffron basmati rice. our house salad – greens topped with feta cheese, walnuts, barberries, kalamata olives & veggies. I've been to Pomegranate and its twin brother Sheherzade many times with different people. The place is simply amazing. 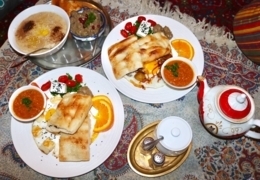 They serve a very authentic Persian food made out of organic ingredients - it simply tastes like heaven! The atmosphere is very special too. You feel like you are in a museum. The walls and the tables are filled with hand-made art and old Iranian photographs so it makes you want to learn more about the ancient Iranian culture. The only downside is that it's very small so always make a reservation. 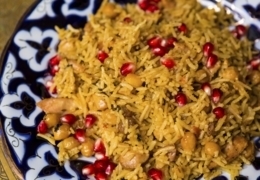 The Pomegranate Restaurant is the full package – home-style Persian dishes served inside a quaint space. 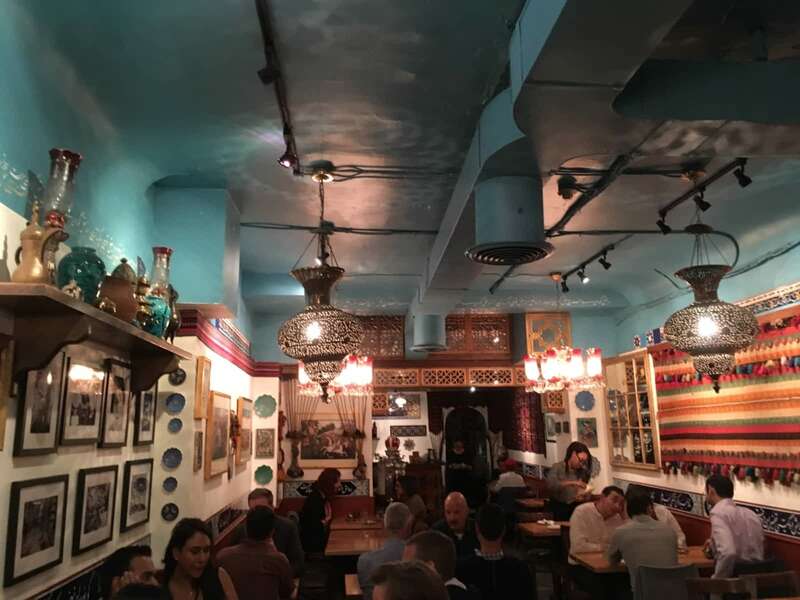 Their decor is like an Arabian night, with Moraccan-esque lanterns hanging from the ceiling, Persian rugs, and Farsi calligraphy on the walls. Try the morasa polo, jewelled rice with a braised lamb shank. What is jewelled rice, you say? It’s a mixture of things blended with saffron basmati rice, like orange peels, barberries, and diced carrots, almonds and pistachios. 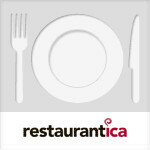 Enjoy some wine or sparkling beverages with your meal, or ease down the food with a cup of fresh mint tea. Amongst pasta and pizza joints on College St. sits The Pomegranate, not so typically nestled in Toronto’s Little Italy. This spot is easy on both the eyes and taste buds, with classic Iranian decor and beautifully crafted meals. Eggplant, lamb, pomegranate and chicken are a few ingredients that build each delight.